St. Patrick is believed to have driven the snakes from Ireland. Once a pagan imself, St. Patrick is one of Christianity's most widely known figures. He is Ireland's patron saint, and died March 17 in AD 461. The modern secular holiday is based on the original Christian saint's feast day also thought to be the date of the saint's death. In 1737, Irish immigrants to the United States first began observing the holiday publicly in Boston, and held the first St. Patrick's Day Parade in New York City in 1766. Today, the tradition continues with people from all walks and heritages by earing green, eating Irish food, and attending parades. St. Patrick's Day is bursting with folklore; from the shamrock to the leprechaun and to pinching those that are not wearing green. The original Irish name for these figures of folklore is "lobaircin," meaning "small-bodied fellow." Leprechauns had nothing to do with St. Patrick or the celebration of St. Patrick's Day, a Catholic holy day. In 1959, Walt Disney released a film called Darby O'Gill & the Little People, which introduced America to a very different sort of leprechaun than the cantankerous little man of Irish folklore. This cheerful, friendly leprechaun is a purely American invention, but has quickly evolved into an easily recognizable symbol of both St. Patrick's Day and Ireland in general. The shamrock, which was also called the "seamroy" by the Celts, was a sacred plant in ancient Ireland because it symbolized the rebirth of spring. By the seventeenth century, the shamrock had become a symbol of emerging Irish nationalism. As the English began to seize Irish land and make laws against the use of the Irish language and the practice of Catholicism, many Irish began to wear the shamrock as a symbol of their pride in their heritage and their displeasure with English rule. - There are 34.7 million U.S. residents who claim Irish ancestry. This number is almost nine times the population of Ireland itself (4.2 million). Irish is the nation's second most frequently reported ancestry, trailing only those of German ancestry. (The ancestry estimates exclude people living in group quarters). - The nation as a whole claims 12% of residents as having Irish ancestry. In Massachusetts this number doubles to 24 percent! - In Middlesex County, Mass., 348,978 residents are of Irish ancestry. Among the 54 counties where Irish is the largest observed ancestry group, Middlesex had the highest population of Irish-Americans, with Norfolk County, Mass., second, with 203,285. - There are three states in which Irish is the leading ancestry group: Delaware, Massachusetts and New Hampshire. Irish is among the top five ancestries in every state but two (Hawaii and New Mexico). - There are 54 counties where Irish is the largest observed ancestry group. Forty-four of these counties are in the Northeast, with 14 in New York, 11 in Massachusetts and five in New Jersey. I suppose because my own ancestry is a good-part Irish (my given name was once O'Laughlin), I could wear one of those silly buttons that reads, "Kiss Me I'm Irish".... but I won't. What I will do though, is celebrate the holiday by making the tradtional Irish-American feast of Corned Beef and Cabbage. Or, New England Boiled Dinner is what my family called it in Boston. Although, my family prefers a smoked picnic shoulder (ham) to the cornned beef in the meal, so we use that instead. Below is my recipe! In large stock pot, cover with water 2" above ham. Add 2 bay leaves and boil for a total of 3 hours. Turnip can cook with this since it takes the longest. Add carrots to the pot 1.5 hrs before eating. Add cabbage & potatoes to the pot 45-1 hr before eating. 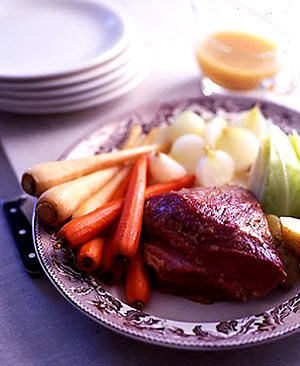 Drain, cut up ham and serve on a large platter with lots of butter, mustard & vinegar on the side to taste. Some crusty french bread and Enjoy! *Note: If your pot is not large enough to cook the vegetables & ham together, the ham can be taken out when it's done and covered for an hour with foil until ready to eat. You can then throw all your veggies in the water and cook them up. You really can't mess this up. So Simple! We cooked ours yesterday. Corn beef, since I'm married to someone named Mary Margaret D. . . Anyway I got the famlies original aluminum stock pot so you know it tastes extra special. Yum!